Panorama of Mgarr Ix-Xini bay in Gozo. Mgarr ix-Xini is reputed to be one of the harbours used by the Knights’ galleys, and lies in a gorge accessible from Xewkija and Sannat. The entrance to this natural cove is guarded by a tower which was constructed by the government in 1661. A tempting walk from the bay to the tower through a restored ancient footpath is beyond doubt a unique experience. The bay is in itself the natural seaward estuary of a deep but beautiful natural valley. It has a small pebbly beach with intriguing caves on cliff faces. This secluded spot is ideal for swimming and very attractive to divers. One can dive to the purposely wrecked ferry “Xlendi” even from this bay. 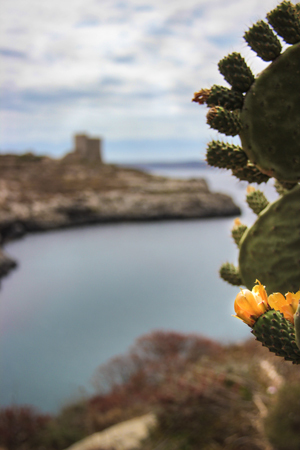 Mgarr ix-Xini is usually a quiet beach in Summer and therefore has kept its natural beauty.